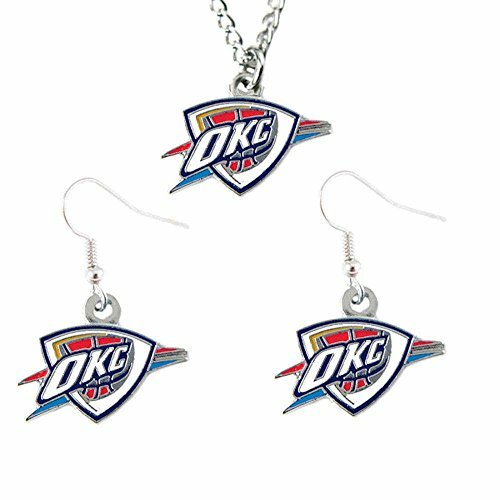 Simple and bold, this NBA Oklahoma City Thunder Necklace and Earring Set is a must-have accessory to complete your game day wardrobe The nickel-finish charm and earrings are decorated with your NBA teams logo. Necklace comes with 18-inch chain. These are metal and wire earrings for pierced ears, nickel-finish, and hypoallergenic. Officially licensed NBA product. Sports gift jewelry set, Features NBA team logo. Logo approximately 34 EACH in diameter, Fish hook earring hanger. Imported, officially licensed NBA product.